Duraquip’s forklift sweeper and collector has been carefully engineered to deliver 2 main benefits: durability and ease of sweeping in a variety of yard, storage area and road environments. The motor for the Duraquip forklift sweeper attachment is housed internally, for ease of sweeping tight up to walls and to protect the motor from any unexpected collisions or bumps. The forklift sweeper collector is manufactured with a 5mm folded single piece, mild steel shell. The hydraulically driven, self-emptying collector gives your employees the perfect tool for easy use and fast cleaning. As standard with all our forklift sweeper brushes, the rotary brush has 22” bristles. You have the choice of either polypropylene or a mixture of wire and polypropylene bristles. For use near and around livestock we advise using polypropylene bristles only: for animal safety. 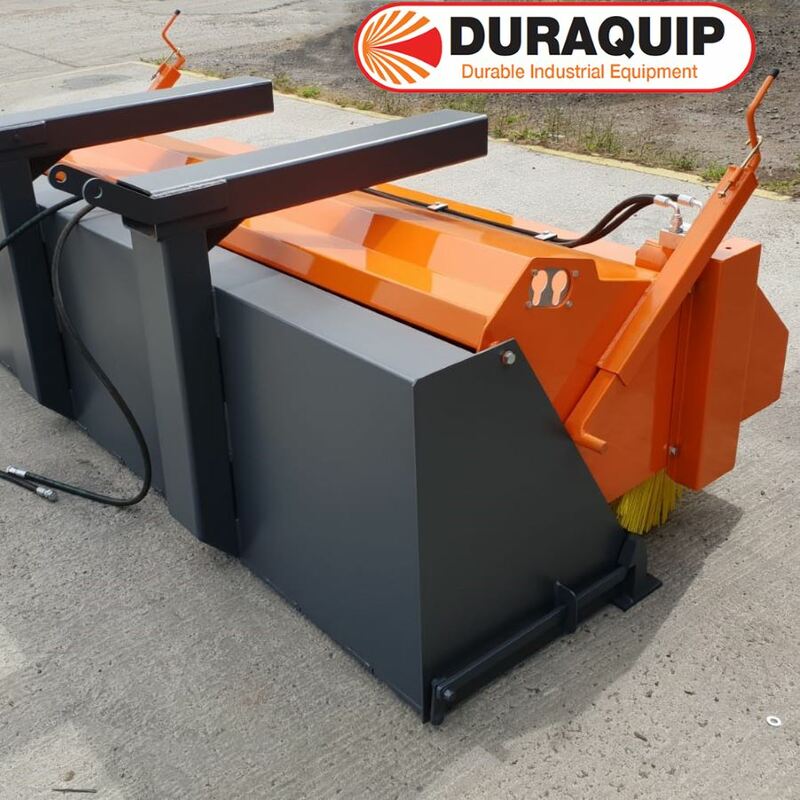 Duraquip’s forklift brush sweeper also features adjustable jack legs for rapid height alterations allowing your staff to work quickly and efficiently in a range of situations in your industrial premises. The standard forklift mounted sweepers, with collector, can be upgraded with a dust suppression system. This is made up of a dribble bar mounted to the front of the forklift brush attachment and fitted with a water tank. Another optional feature is a kerb brush that can also be attached for up to the edge cleaning and tight spaces helping to make this forklift sweeper & collector attachment stand out from the rest. Designed and manufactured in our Kirkbride workshop in Cumbria for almost 30 years. This product, originally part of our Agriquip range, is a highly versatile yard, street, or road sweeper attachment, for forklift equipment already on hand. 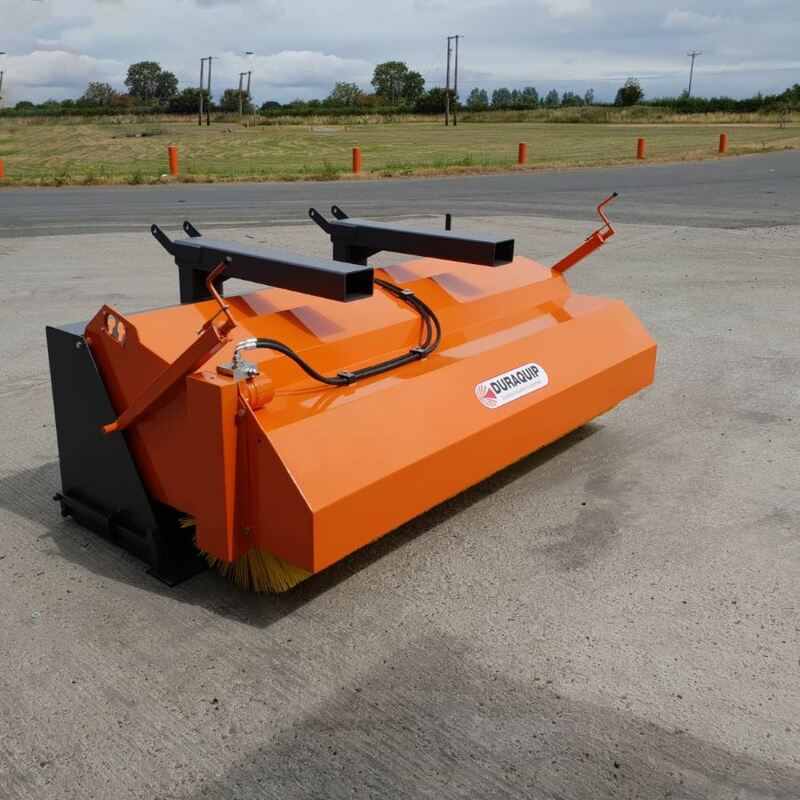 This sweeper attachment allows existing plant to be used in a wider range of applications to meet the needs and demands of a vast number of industrial and commercial users. Available in a range of widths to meet a range of industrial, construction and material handling customers’ needs. Designed and Manufactured in the UK – support from real people who understand your needs. One Piece Folded Shell in 5mm steel – durability. 3 widths available: 1.5m (5’), 1.8m (6’), 2.13m (7’) – suitable for multiple working environments. Hydraulic Self-Emptying Collector – speed, efficiency and convenience. Inboard Motor – designed with protection and long working life in mind. Flow Control Valve for Variable Speed Adjustment – adaptable to all cleaning environments. 22” polypropylene Bristles – standard size, easily replaced. Adjustable Jack Legs for fast height alteration – speed and efficiency.